Learners were taught the importance of teamwork and how to brainstorm creative solutions using the theoretical and practical parts of civil engineering. WATER WINNERS: Professional Technologist for SMEC Tronel Strydom (centre) joined the winners of the iGEMS Water competition, from left, Sanctor High School learner Cursty Adams, Ethembeni High School learner Basetsana Malie, Douglas Mbopa High School learner Xhanti Qandana and Chapman High School learner, Matthew Human. The South African National Roads Agency (SOC) Limited (SANRAL) supported high school learners in Port Elizabeth as they participated in the water engineering competition hosted by iGEMS. 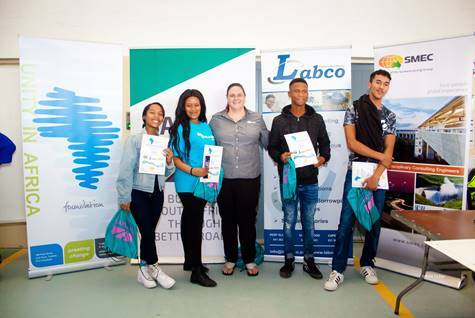 SANRAL, together with SMEC, Labco and iGEMS, collaborated in hosting the fifth annual iGEMS water engineering competition, which educated high school learners on the skills required to plan and build a water distribution network. The competition was held at the SANRAL’s Regional Training Laboratory on 25 March. The Port Elizabeth learners were taught the importance of teamwork and how to brainstorm creative solutions using the theoretical and practical parts of civil engineering in order to build infrastructure to provide clean water. “This competition is very practical, and it gives learners the opportunity to work in teams, with their hands and look at practical issues in the civil engineering sector,” said Tronel Strydom, Professional Technologist for SMEC, who judged the water competition. She added that civil engineers understand that all communities deserve good reliable infrastructure. The 15 participating schools included Alexander Road, Douglas Mbopa, Cillie, Ethembeni, Hillside, Khwezi Lomso, Molly Blackburn, Newton Tech, Chapman, Sanctor, Uitenhage, Daniel Pienaar, Woolhope, Lawson Brown and Ndyebo. The teams of grade 11 and 12 learners were required to build a water distributor to distribute three-litre bottles equally between three points on a grid, making use of different connections and two different diameters. The learners were then judged according to a penalty point system. Basetsana Malie (Ethembeni High School), Xhanti Qandana (Douglas Mbopa), Cursty Adams (Sanctor) and Matthew Human (Chapman) were the winning team. Malie, an 18-year-old grade 12 learner, said her team started off not knowing what to do. Human, a 16-year-old grade 11 learner, said it was important to study civil engineering. “Civil engineering is important to build infrastructures to provide efficient ways for equal water transportation,” said Human. Mbulelo Peterson, SANRAL Southern Region’s Manager, said in addition to supporting the iGEMS Water competition, SANRAL promotes the importance of civil engineering.